The queerness of Testosterone propionate is that, for example, when compared to so loved by the bodybuilders testosterone enathate, it retains water only in minimal amounts. It may be purchased in our shop. By the way, namely because of this fact some musclemen consider it to be ineffective. And so it is: it is difficult to accumulate 8-10 kg within a month using it, on the other hand it may be done by the use of testosterone enathate or methandienone. However, experienced athletes find this property very valuable and actively use propionate during the prior-competition preparation. The combination of propionate with one or some highly anabolic and low androgenic steroids like Strombaject or Primobol contributes to growth of quality musculature and faster burning of under-skin fat. In addition, it was observed that these combinations are a classical example of synergy when the preparations which are not too actively effecting when used separately, become much more effective during the combination. It may also be purchased from our shop as well as retabolil. Anyway, this doesn’t mean only poor bodybuilders “approach” the competition. The fact is that testosterone compound lets the organism restore better after the loads, because testosterone contributes to organism’s secretion of creatine-phosphate, and that’s why even the wealthy athletes try to include at least one androgen to their pre-competition steroid cycle. It is understood that propionate is preferred due to the reasons stated above as a preparation checked by time, although some prefer more expensive but less investigated andriol. One more interesting property of propionate is that it starts working very fast after entering the user’s organism and is also derived with the same speed. The advantages of this feature are obvious: if the athlete, addicted for steroids, desires to see their work, then he may inject some testosterone propionate at the beginning of the course. The testosterone level in the organism will jump significantly and when propionate stops working, harder steroid artillery will start working. By the way, such preparations like Sustamed have bodybuilders love also due to the fact that they have propionate in the composition which lets start the deal without long warming. One more advantage of this property is that it is possible to prepare for the championship with propionate when doping-test is scheduled. The fact is that the “Testosterone/Epitestosterone” indicator in the urine is decreased together with the testosterone concentration in the blood after testosterone propionate injection. This indicator quiet sharply decreases to the mark of 6 which although exceeds the testosterone concentration in the blood but is not caught during the doping-test. Besides this the organism doesn’t cope to go into catabolism state that could cross out the trainings results. The negative part of the short-timed work of the propionate are quiet often injections. There is no sense in injecting propionate less than three times a week but some users, especially those who fall for high dosages may use it everyday. You should agree that this is not too comfortable. It is fact that females get maximum profit from propionate while minimum risk for the health just thanks to relatively rare injections. Injection of 50 mg of propionate once in 5-7 days doesn’t lead to the accumulation of androgens in the female organism and, consequently, appearance of such virilization cases as hair growth on body and face, voice deepening etc., but at the same time effects well the musculature. There is one more interesting thing that is related to propionate. I used to know the athletes who regularly have local injections of propionate (usually to calf, more rare to biceps and deltas), especially when due to some reasons escyclen wasn’t available – preparation of local action for the muscles. As a result of such injections there appeared packings inside the muscles that made it visually bigger. Propionate is quiet harmless preparation in sense that its use quiet rare results in side effects. In any case, liver and kidneys don’t suffer, just under super-dosages. The only thing that you may accidentally have is blackheads and gynecomastia. 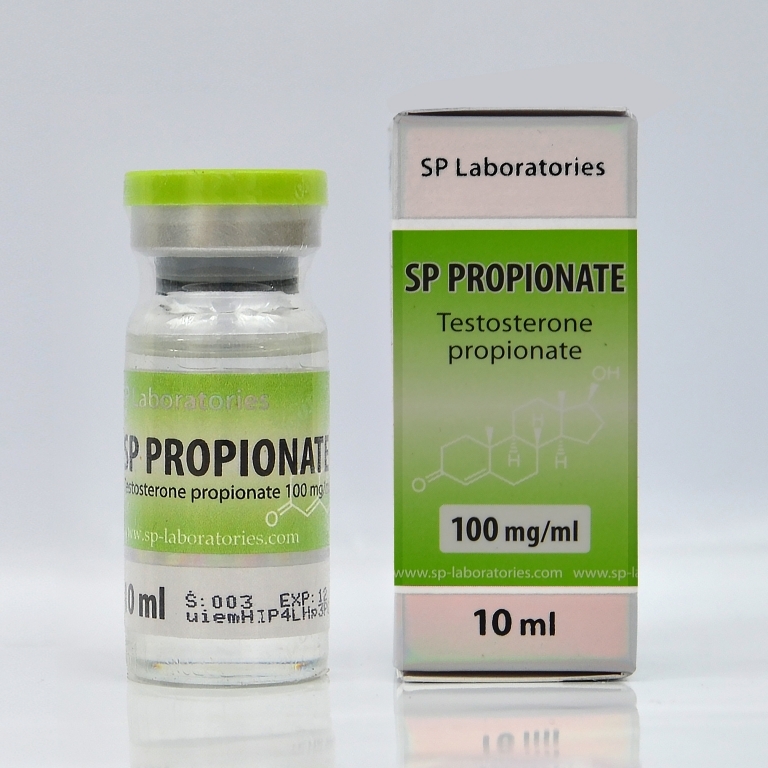 Yes, propionate interrupts the production of testosterone by the organism itself quiet well, that’s why it is recommended to use Provimed at the end of the course for this steroid. Anabolic steroids and sports pharmacology internet-shop. You may purchase/order testosterone propionate. Where to purchase/order testosterone propionate: in USA, Europe and Great Britain. We have good prices for all anabolic steroids.